Kaua’i is beautiful. And a big change from O’ahu, which is the most developed island and full of tall buildings! 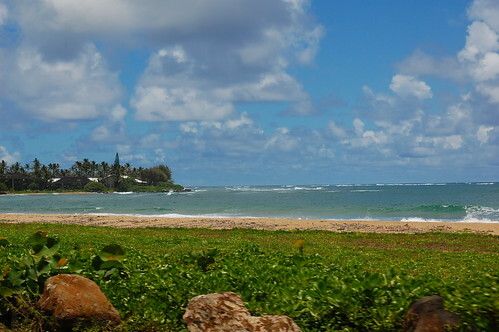 There aren’t any tall buildings on Kaua’i, apparently because there’s a law that says that no building can be taller than a coconut tree! We flew on Hawaiian Airlines, which was fine and super short – about 30 minutes total. Then we picked up our rental car and headed for the resort. There’s just one highway that goes around the perimeter of the island, where all the towns are – the interior of the island remains all rainforest and jungle. 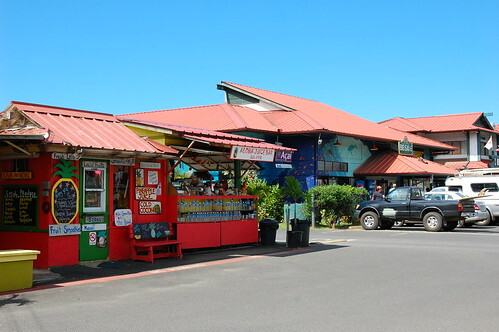 We got to the resort a little too early to check in, so we took a drive up to Hanalei, where there’s this little shopping plaza. I found a cute bamboo jersey dress and the yarn store! 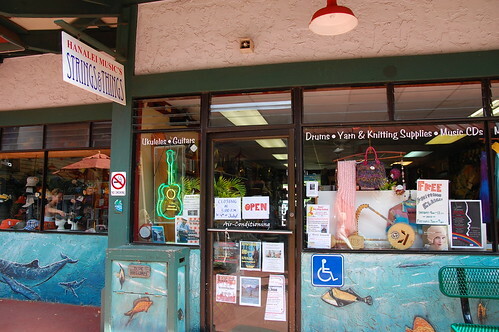 Strings and Things is half music store and half yarn store! They did have a little bit of locally dyed yarn, but otherwise a mostly mainstream selection. 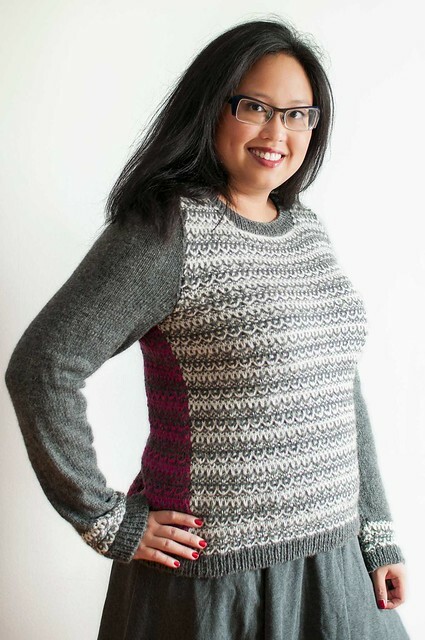 I do wish I’d looked for that yarn store in Honolulu that had Japanese stuff, but oh well. Sunday we went for a drive up the coast and stopped at a couple of beaches for pictures and a little bit of walking along the water line. 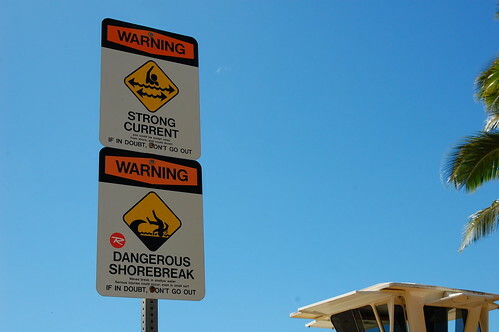 I’m a little freaked out about swimming in the ocean here because Kaua’i is known for rougher waters, a strong undertow and riptide. There was even a handout at the resort on “How to survive a riptide”. Yikes. 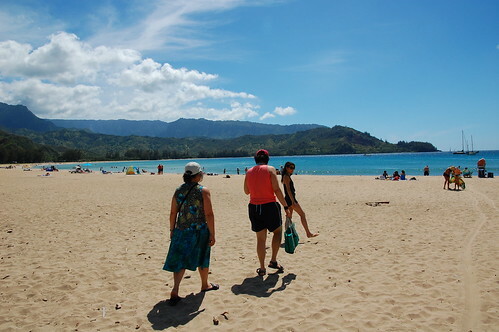 Hanalei Bay was rated #1 beach in the world on some list – it does have a pretty awesome view! Thanks for the pictures. 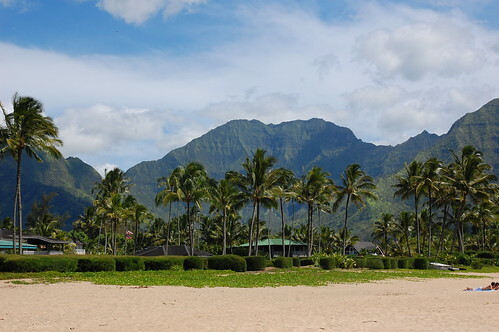 My husband and I were married on a beach across from the Cocoa Palms Resort (Elvis’s Blue Hawaii fame) in Kaua’i in 1990 (before the hurricane!). I remember all of the spots you’ve shown. I want to go back on our 25th anniversary. It is truly paradise. I cannot believe how blue that sky is! So jealous…..I am enjoying every single pictures you’ve taken! Debbie is right – it’s truly paradise! wow. That’s just gorgeous! I love the ocean! What gorgeous views! I love how all of the colors pop. I’m right there with you on the swimming thing–playing in the surf is plenty! Jealous!!! It’s just like I remember it – simply gorgeous! Your pictures make me want to go back so bad! 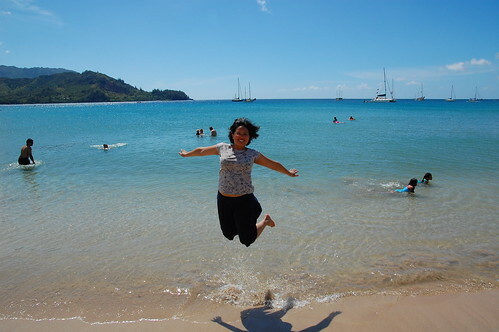 I love Kauai! Love it!